I'd like to present a command-line package manager written specifically for portable apps - Pint. This is the first public announcement, so I'd be grateful for beta testing, questions, and any input. Pint was created as a lightweight alternative to Chocolatey, though approximately at the 60th commit I also discovered Scoop, which still lacks some features I needed. Downloads, unpacks and removes applications. Checks for updates and downloads them if available. Extracts downloads links from websites using Xidel. Supports RSS and PAD files as link sources. Unpacks various types of archives and installers and upgrades apps using predefined rules from the database. Apps can be installed into an arbitrary subdirectory under apps. This allows to keep yaP/PortableApps.com packages up to date. Automatically detects console applications and creates batch redirects for them in the apps directory. Can remember, if a 32-bit or a 64-bit application was installed. Can handle multiple installations of the same application. Forms a report with all installed applications. Can temporarily suppress updates for selected apps. Provides a way to subscribe to multiple remote databases, even choose not to use the default one. Is able to search across all subscribed databases. Allows to keep a custom user database in a separate file (by default, packages.user.ini). Allows to override paths and settings via environment variables. Unlike Chocolatey and Scoop, Pint's database does not require constant attention by humans. Pint will automatically detect, download and install an update once it becomes available on a website. Last edited by Bonaparte on Tue Jan 09, 2018 7:48 pm, edited 4 times in total. I proceeded to try to download the stated requirements and got halfway with Xidel and nowhere with 7-zip and innounp. Exception calling "NameSpace" with "1" argument(s): "Unspecified error (Exception from HRESULT: 0x80004005 (E_FAIL))". Then I decided to try Scoop (http://scoop.sh/) and got nowhere as well. Maybe I'm just thick as a brick. This sounds amazing. The fact the it can apparently keep the config files / existing structure in tact while also updating in place sounds so useful. How does it detect which files to update and which not to, or is that only for PortableApps programs? That's embarrassing, I should have tested it on a clean system. Fixed the update URL and 7-zip detection, please redownload pint.cmd. Though the NameSpace error is a bit suspicious, may be ZIP support is disabled in your system? It could be done manually. Last edited by Bonaparte on Mon May 09, 2016 8:11 am, edited 1 time in total. Specular wrote: This sounds amazing. The fact the it can apparently keep the config files / existing structure in tact while also updating in place sounds so useful. 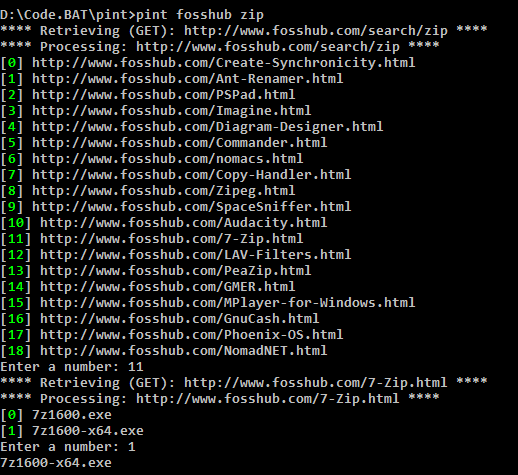 First, Pint unpacks an archive to a temporary directory. Then it tries to detect a root path of the app inside the archive. It would be either the base parameter from the db, or a closest .exe file. Next, it copies configuration files from the app directory to the temporary directory (either *.ini and *.db files, or what's defined by the keep parameter in the database). This process is tricky, indeed. Upgrade of the do-it-yourself apps, like foobar2000 and 1by1, is handled with the only parameter: Pint removes certain files by mask from the destination, and then copies files by the same mask from the archive. This looks pretty neat (yay for batch files ). I'll give it a go and provide you some feedback. shnbwmn wrote: This looks pretty neat (yay for batch files ). I'll give it a go and provide you some feedback. Pint started as a true-batch script, but after some time it became a burden. Nevertheless, it was fun. The 'self-update' error is gone after re-download. Bonaparte wrote: Though the NameSpace error is a bit suspicious, may be ZIP support is disabled in your system? Midas wrote: The 'self-update' error is gone after re-download. - 7-zip can unpack itself. .NET framework 4.5+ has another library for that, but as I intend to keep the requirements low, I'm avoiding it for now. I'll make a workaround, hold on. 'ng' is not recognized as an internal or external command, operable program or batch file. Bonaparte wrote: .NET framework 4.5+ has another library for that, but as I intend to keep the requirements low, I'm avoiding it for now. Please note the absence of search parameter. Another thought that immediately sprung to my mind is how extremely useful it would be to achieve some kind of interoperability between Pint and the open SPS format used by SyMenu and SPSBuilder (see http://www.portablefreeware.com/forums/ ... hp?t=21891). Not only does the SPS format cover a thousand portable programs already (see http://www.portablefreeware.com/forums/ ... hp?t=22879 and http://www.ugmfree.it/SyMenuSuiteSPS.aspx), but SPSBuilder provides for an easy and able GUI editor for the addition of many more. Pint could do this easily by parsing all SPS files in a folder to build a custom 'packages.user.ini'. Or, better yet, by accepting such files directly for input, extracting required info from them on cue (I'm guessing "Program name", "Packer format", "Download URL" and maybe more, depending on whether 'packages.ini' format is documented further). Just my 2 centimes. More testing forthcoming. Another thought that immediately sprung to my mind is how extremely useful it would be to achieve some kind of interoperability between Pint and the open SPS format used by SyMenu and SPSBuilder (see viewtopic.php?t=21891). Thanks for the tip, I didn't know about this program, this database will definitely be useful. Yes, it's possible to install any archive from an arbitrary URL, I even played a bit with wizard-like clients for some popular websites ( http://i.imgur.com/kAlrT0u.png ). The main issue here is unattended software upgrade. I try every program and check, what configuration files it uses. I've got some ideas, how to automate it completely (like comparing created timestamp of a directory and modified timestamp of files inside it). If I fail with this, apparently the only way would be a yet another online community-driven software repository. I'm still adding features to the packages.ini format (just now I enabled using of preudo-extensions .arch and .any). Of course, the documentation will follow. @Bonaparte: When trying to run "pint upgrade", I always get the following error... after that, nothing happens. My portable apps are in a subdirectory like d:\apps\. So I added pint.cmd to d:\apps\pint.cmd and have custom-configured Pint's environment variables so all Pint files live in d:\apps\Pint. I tested a few apps and they seem to work fine! 1. I would like to see a command to remove installer files from the dist directory since that directory can grow quite fast. 2. Can you install the xidel dependency in the .shims directory? xidel is really only useful for Pint. Also how do you install specific versions of an app? Let's say I want the 32-bit version and not the 64-bit one, how do I tell Pint that? Or is Pint smart enough to determine which version of the app is in the directory. Midas wrote: @Bonaparte: When trying to run "pint upgrade", I always get the following error... after that, nothing happens. Google says this message is produced by print.exe. Yet there is no a single call and even a string with this word in the script. What about pint outdated, does it work? freakazoid wrote: 1. I would like to see a command to remove installer files from the dist directory since that directory can grow quite fast. 1. Ok, I'll add it. Pint can detect bit count of executables, but in real world this perk appeared to be useless, because many apps contain both types of executables. So I commented that code out and let humans decide.